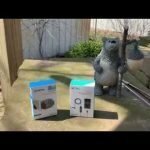 When I recorded my initial review of the Gear Sport something I was asked was related to the ability of the Gear Sport to track hiking. Did it have breadcrumb trails? A barometer? 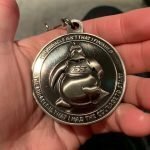 Altitude info? While it does have a barometer (with impending storm warnings) and an altitude widget that appears to be fairly accurate, it doesn’t have breadcrumbing, at least not as a native app but by using third-party apps you can get breadcrumbing. And oh, if you’re not sure what I mean by breadcrumbing, it’s basically a trail created by your GPS location. As you walk, run, or move by whatever means, a trail is drawn and displayed to show the path you have taken. Remember that old Brady Bunch episode when Greg, Peter, and Bobby were returning the cursed Tiki statue to the cave and used popcorn to create a trail to follow back to the highway? That’s breadcrumbing, well…with popcorn but you get the point. It’s basically used to help you get back to where you started and unlike popcorn or real bread you don’t have to worry about birds, squirrels, or mentally ill archeologists that speak to statues they’ve named Oliver eating the trail displayed on your watch. Other watches are designed specifically for hiking such as the Suunto Traverse or the Garmin Fenix series. 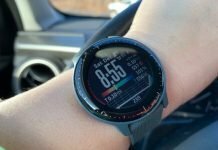 If you want a serious hiking watch that has extended battery life, the ability to mark waypoints and follow per-defined routes then I’d suggest looking at one of those but the Fenix is pricey and the Traverse is geared specifically for hiking. I prefer multi-sport function watches like the Gear Sport, even if it has somewhat limited hiking features because I do a lot more than just hike, especially in December. It’s too cold out there for me! 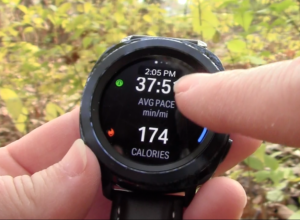 As a less expensive or more versatile alternative to a dedicated hiking watch you can also try Android Wear. Android Wear watches support some really good hiking apps. 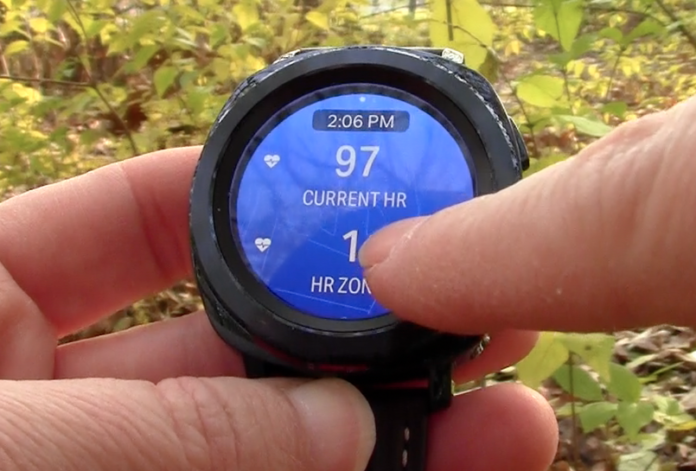 You might want to take a look at my review on YouTube for the Ticwatch E because I show a few hiking apps in the video that I particular like: BackCountry Navigator, MapMyHike, and View Ranger. 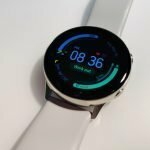 For the Gear Sport, MapMyHike is very much like MapMyRun which is available for the Gear Sport so you’re getting pretty much the same features. While the Ticwatch E isn’t by any means a hiking watch, it is fun for people like me who are your typical Sunday afternoon hikers. I’m not hiking through the Rocky Mountains or the wild jungles of Peru. I’m in Illinois with lots of corn. 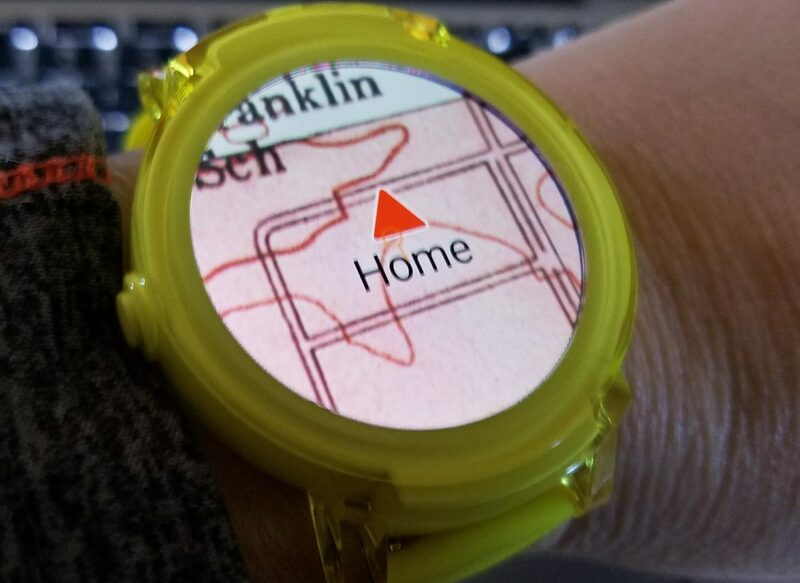 I’m in city parks and conservation areas but hey, you (or maybe just I) can get turned around in any forest so it’s nice to have a good navigational tool on your (my) wrist. The only problem with Android Wear watches for hiking is that battery life isn’t the greatest or most dependable. Most Android Wear watches are fine for short hikes but not for a multi-day hiking adventure, unless you have a way to charge the watch. 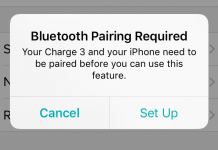 They also may rely on a data connection for some features which may not be available in more remote areas. 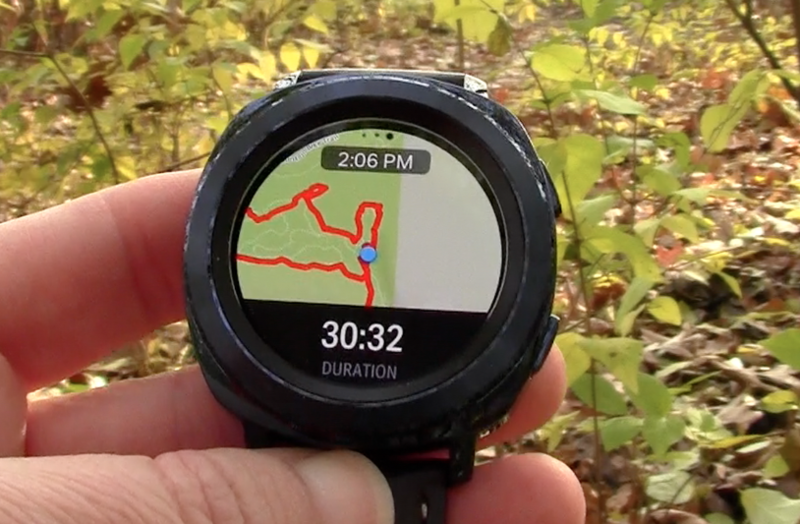 However, View Ranger does allow you to download routes onto your watch and enable you to trek phone-free. I’m still testing out BackCountry Navigator on the watch but I know it does allow the downloading of maps to your phone for offline usage. So, I would imagine those would be mirrored on the watch too. I’m going to be writing up my experiences in much greater detail with both View Ranger and BackCountry Navigator both for Android Wear and to use simply with a smartphone, so stay tuned if you’re interested. 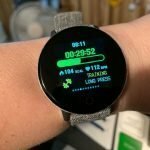 With all of that said, I have used the Gear Sport on hikes but have been disappointed that there isn’t a great dedicated hiking app for the watch which stinks because I think the watch could certainly support one. It has a good enough battery and an accurate enough GPS sensor to handle a full-featured hiking app. It’s also waterproof, able to calculate barometric pressure and altitude, so everything hardwear-wise is available. We just need the software to take all that information and put it together into a hiking app. 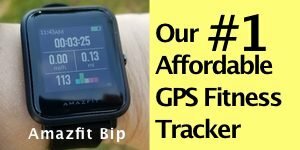 So far the best apps that I’ve come across for hiking with the Gear Sport are MapMyRun and Endomondo which are basically the same app but function a little bit differently. Both apps are owned by Under Armour which also owns MyFitnessPal and all the other MapMyWhatever apps. No, these aren’t hiking app per se but they do display a map, your location on the map, and a breadcrumb trail of the path you’ve taken. Those are three essential ingredients to a hiking app and both MapMyRun and Endomondo do a good job with all three of these things. Unfortunately, there isn’t a way that I know of to import a GPX route to the Gear Sport. That would be ideal for a more planned hiking trip. There are other apps available to download on the watch such as a compass and apps that provide a quick display of your GPS coordinates but it would be nice to have all of those things in one package rather than having to switch back and forth which isn’t very practical when out on the trail. So, no there isn’t a dedicated great hiking app for the Gear Sport but you can still have breadcrumbing through MapMyRun and Endomondo and possibly other apps I have yet to discover. For the type of outdoor treks that I take these apps are good enough most of the time but if you’re in a true wilderness area I’d point you in the direction of a watch specifically dedicated to hiking. Those are the watches with highly accurate GPS, long battery life, have the ability to mark waypoints, import GPX files, etc. I’m on the lookout for a good watch that will fit that bill for myself. Right now I’m looking at the Garmin Fenix 5s and if Christmas is really good to me (and I sell some of my other watches I no longer use) I might have a new toy to play with, although I’ve read mixed reviews of the watch. However, I’m not sure what to think of them. 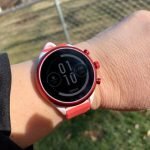 The Gear Sport 2 never had more than a 3-star review on Amazon which I never thought was fair or accurate because I found the watch to be pretty darn good in every thing it did for me. We’ll see about the Fenix. I’d like to try the watch out and if it doesn’t live up to my expectations I’ll send it back because it sure ain’t cheap. Anway, happy trails to you and by the way if you’re interested in the Gear Sport as a good fitness watch I do recommend it. 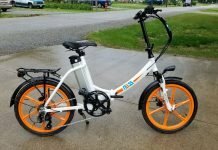 I’ve been using it for several weeks now and it’s been doing a fantastic job. It’s been great for the type of workouts that I do such as on the treadmill, exercise bike, elliptical, and for other cardio workouts though like nearly all wrist HR sensors it doesn’t do so great for weight lifting, and I’m not sure how well it works for running since my knees are way too old for that. 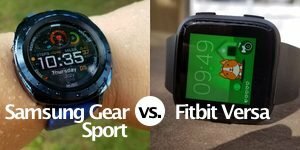 "gear sport for hiking" "hiking apps for gear sport"